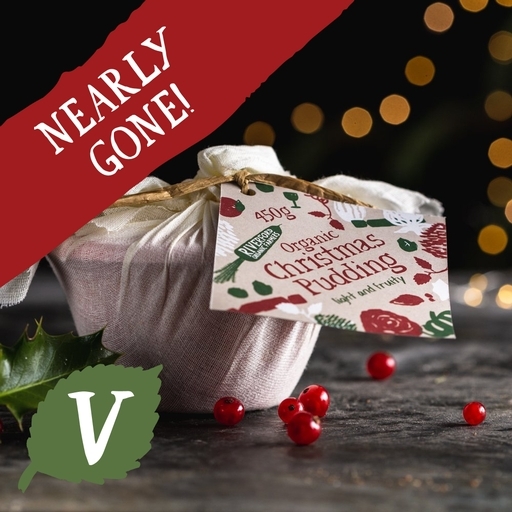 Unlike many Christmas puddings, which can be heavy and hard-going after a main meal, ours is wonderfully light, fruity and fresh-tasting. Grated Riverford carrots and apples with warming brandy, golden syrup, spices, and a generous mix of other fruits go into our festive pud. You’ll find room for this one after Christmas dinner! Serves 4. Remove label. Steam pudding in its muslin-wrapped basin for 1 and a half hours. Flame with brandy, and serve with generous dollops of clotted cream or brandy butter. Store in a cool dry place, out of direct sunlight, or freeze on day of delivery.